Seven Cups is an American tea company based in Tucson, Arizona. We source traditional, handmade Chinese teas directly from the growers and tea masters who make them, and we bring those teas back from China to share with people everywhere. This direct link to authentic Chinese tea masters is what makes Seven Cups special. While most tea companies focus on their packaging, 100 percent of our focus is on the tea inside the package. Sourcing is our key competency, but we also are dedicated researchers and enthusiastic students. There is no end to the complexity of Chinese tea and tea culture and we are continually publishing what we learn on our site. We’re also dedicated to promoting Chinese tea culture. Seven Cups is a member of the Chinese International Tea Culture institute, and Austin Hodge is the first American to be published in their journal. 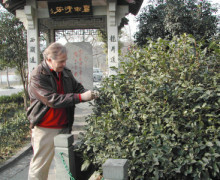 Austin was awarded a four year position in the institute as an Honorary Director for his contributions to Chinese tea culture. From our beginnings at the St. Phillip’s Farmers Market in Tucson, Arizona, we’ve built a company that connects tea masters across China to tea lovers in more than 50 countries. From Singapore to Salt Lake City, Portland to Prague, Brooklyn, London, Beijing and Bangkok, tea lovers across the United States and around the world are finding the teas they want and the information they need at Seven Cups. We want to thank all of you for your support, and we look forward to building strong relationships with you. In 2004, Austin sits with 80 year old tea pickers in Xiao Hu Zhai Village in South Yunnan. They have never worn shoes before. Austin has tea with display tea inventor, Master Wang Fang Sheng. Questions about our teas? Drop us a line anytime at (520) 628-2952 or [email protected] We’d love to hear from you.